When I tell people that I read books about genetic engineering in creating creatures of heightened intelligence using ancient viruses to create biowarfare, I was often greeted with huff of disbelief. I know I have been going on and on about my love for chick lits (and more recently, of cupcakes), but do I look like someone whose interest in books seem limited to all covers pink and pastels? 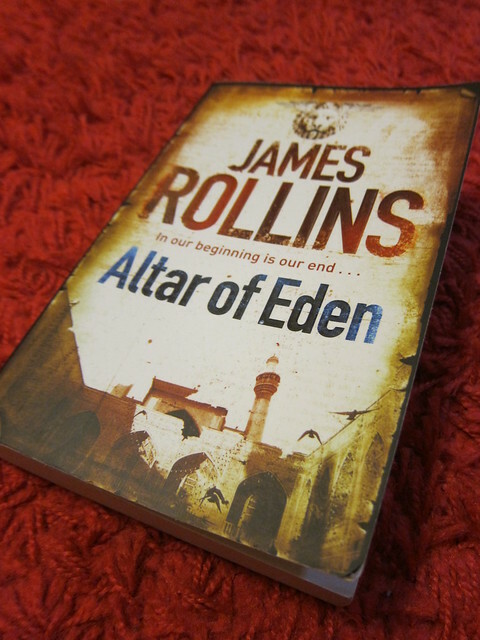 Altar of Eden by James Rollin is your cookie-cutter science fiction of a novel, complete with a heroine with a dark past, a brusque hero with a soft spot for (surprise, surprise) the heroine, the unpredictable yet likeable sidekicks, the concerned and yes-I-will-get-injured brother… the list went on. Not indefinitely, thanks to the literary God. I was losing track of the throngs of unnecessary characters. But what worth mentioning is the scientific background of the case for human performance modifications. There is an author’s note towards the end of the book which explained the scientific facts of the story. You’ll appreciate the amazing use of fractal, genetic throwback and ancient viruses once you have read the adventure of Lorna and Jack, spanning from Baghdad to New Orleans to the Caribbeans. Worth a read? Yes, but if it is the last one of your unread books. James Rollin’s plots are as predictable as my next Starbuck’s muffin; sweet, full of calories and ultimately bad for my waistline.